the family moved frequently, so her schooling was experienced in Winnipeg, Calgary, Medicine Hat and Vancouver. She was strongly influenced by her time in Brownies, Guides, Rangers and then as a leader with Guides, along with the Anglican Young People’s Association (AYPA) and teaching Sunday School. Involvement in Rangers was a time of travel, fellowship and outreach projects to the disadvantaged and handicapped. Holidays with family, friends and relatives travelling in Canada brought enjoyment of camping and the outdoors. “Since the age of eight when an SSJD Sister spoke to our Sunday School class, I had a longing to give my life to God in some way”. Teen years in Medicine Hat surrounded by SSJD Associates and teaching Sunday School, continued to nourish the spark. “I became an Associate in the early ’60’s in Vancouver and, after finishing my BA at UBC in May 1965, I came for a month’s holiday to the Convent, hoping that would either confirm my call to the religious life or free me to ‘get on with other plans’ – marriage, lots of children, teaching, postgraduate studies…. My call was confirmed, so I entered in October ’65 at age 22. 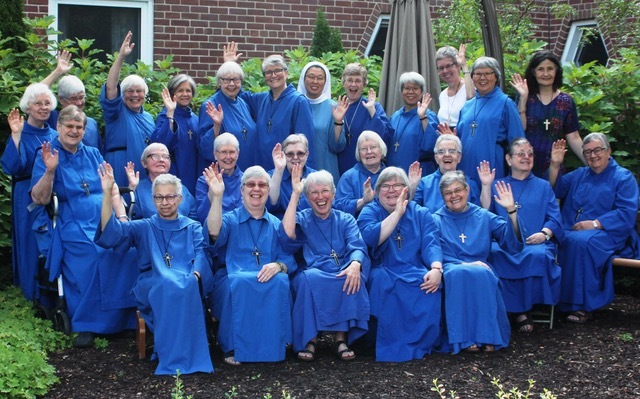 Highlights for Sr. Doreen “have always centred around our life together, doing whatever was needed to make our Community strong and authentic in its outreach to others and the world”. From retreats, missions, spiritual direction, cooking in the Convent kitchen to times in Regina and Edmonton houses and our Home for the Elderly and Cana Place, VP at St. John’s Rehab Hospital (SJRH), starting a branch house in BC – and now a return to the Convent and Community life here – have all added their own highlights to the underlying foundation of prayer, hospitality and service”.